It takes a lot of trial and error to get fusing down to a science. Don't burn yourself up over it! The products listed on this page will help to make your firing times execute smoothly. The product formerly known as MR-97. ZYP works wonderfully as a ceramic or stainless steel mold release. 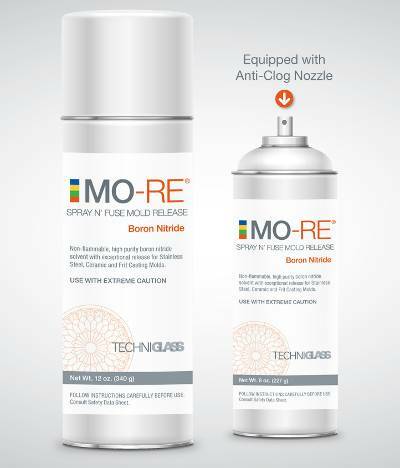 It's easy to use, simply spray this aerosol on your slumping or casting mold at room temperature (wear a dust mask and spray outside only for safety). 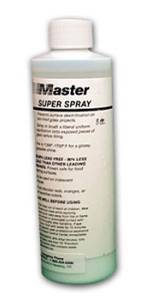 Easy spray-on formula provides a uniform slick coating to produce a flawlessly smooth and easily released project. 13-ounce container will prime about 20 medium sized molds. You may need to touch up the areas where the glass touches the mold after 4 or 5 firings. Be sure to periodically brush off previous applications with a nylon brush to prevent build up. Sold in 13 oz canisters. Note: This item cannot be shipped via air or USPS. in a handy box dispenser. PAPYROS Kiln Shelf Paper is a ceramic-based paper specially formulated for glass fusing. When placed between the kiln shelf and the underside of a glass project, PAPYROS prevents the glass from sticking to the shelf during firing. PAPYROS is available in 20.5"x20.5" sheets or in a space-saving 20.5" wide, 82 foot long Craft Roll that comes packaged in a handy dispensing box. Cut only what you need! Because of its sturdy composition, PAPYROS provides excellent glass/kiln shelf separation on the first use, and may be re-used in subsequent firings, as well. How long post-fired PAPYROS retains its integrity depends on the type of glass used on the project underside (Opal vs. Transparent), the nature of the project (volume/construction), as well as the final fusing temperature (degree of glass movement in the kiln). Clean up is simple via a studio spatula or using your favorite HEPA shop vacuum.. This heat-resistant, light weight ceramic impregnated paper, provides excellent separation between kin shelf and glass in kiln firing applications up to 1600°F. Paper is .008" thick. 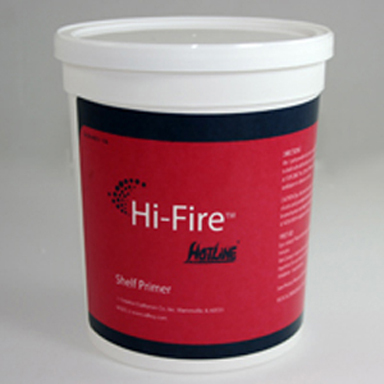 Thinfire has numerous benefits when compared to more conventional ceramic fiber material. 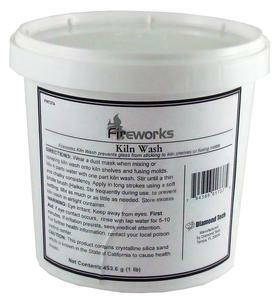 Compared to conventional kiln washes, Thinfire reduces shelf preparation time and improves surface release quality. A single layer of paper will prevent molten glass from sticking to your shelf at full fuse. Sheets are 20" x 20". Can be molded around an object. Sheets are 24" x 20" x 1/8". Let us know if we can cut it for shipping. Sheets are 24" x 24" x 1/16". 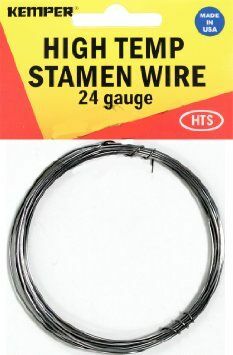 General purpose wire that remains strong in the extreme heat of kiln firings and withstands high temperature for long periods. Great for stems in flowers, ornament hangers, fused glass jewelry and more. A roll contains 10 ft. of wire. 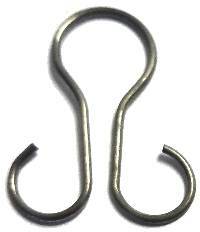 Tired of making your own hangers to put into your fused pieces? 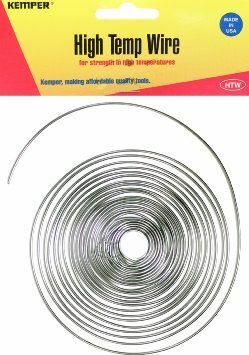 Made from high-temp nickel-chromium metal and able to withstand 2000° heat, these hangers will secure your pieces with confidence. 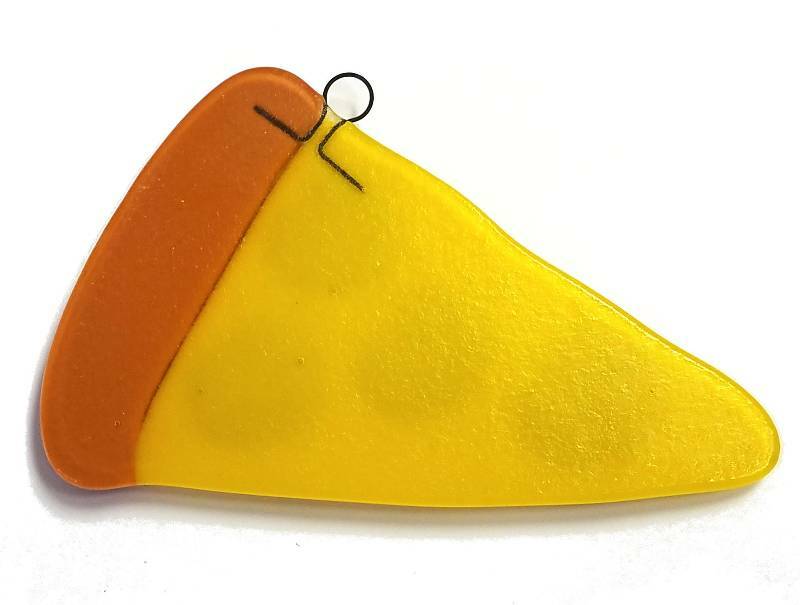 These unique shapes will help them to stay put between the fused glass pieces. They will not lose shape or color during firing and can withstand multiple firings. 8 hangers per bag. Lays down a smooth coating of glass separator or primer on kiln shelves or molds. A must for all your coating needs. A special formulation of alumina and low-fluxing clays developed to withstand the high kiln temperatures required for raking. Contains a pink dye which burns off when firing. An excellent smooth finish between the glass and kiln shelf. 24 oz tub. High temp wash prevents glass from sticking to shelf and stainless steel molds. Easy mixing instructions included. 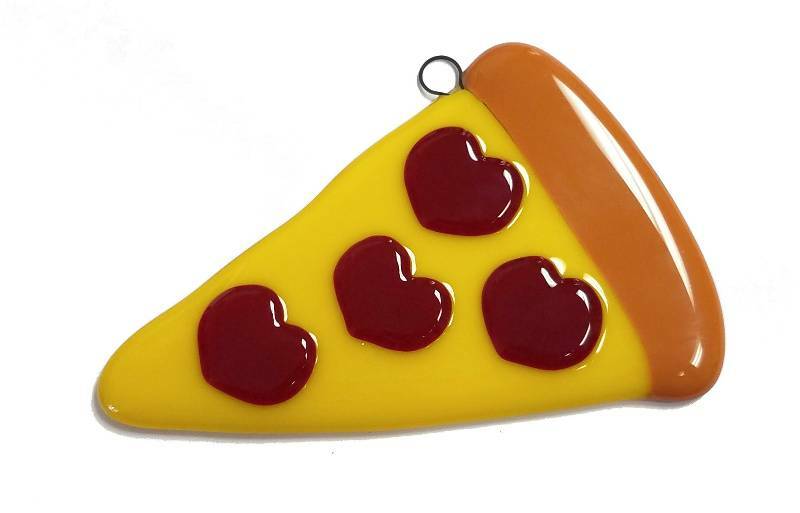 One of the best and safest overglaze. It does not contain any lead or glass powders, only a natural fluxing agent that produces a durable glossy shine on the surface of your fired glass. Completely safe to use on food bearing surfaces. Ideal for use on clear window glass, as well as colored glass like Spectrum and Bullseye, Uroboros and others. 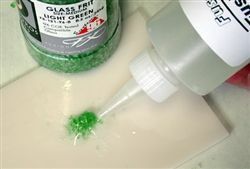 To apply, just brush or spray a light coat onto the top surface of the glass being fused. Has a working range of 1350°F to 1550°F. 8 or 32 oz. bottle. A 99.98% lead free overglaze that prevents devitrification on kiln fired glass projects. Proven safe for food bearing surfaces. It can be used on iridescent or dichroic glass and will not discolor reds, oranges and other sensitive colors. Just brush or spray it on. Matures at 1350°. 8 or 32 oz. bottle. Designed to mature at 1100°F, this overglaze can be brushed or sprayed directly onto the surface or ground edges of a piece of glass to prevent devitrification during the slumping cycle. Ideal for single layer bending such as bent lamp panels. This product needs to be fired at least to 1100°F for at least 5 min. Holds up to 1300°F. NOT safe for food-bearing surfaces. 4 oz. Apply to fusing projects before firing to prevent devitrification on the glass surface. Fire to minimum 1350°F. Contains no toxic or harmful chemicals. 16 oz. Glue for glass kilnforming. Holds pieces in place prior to firing. Slow drying allows readjustments as you work. Organic colorant lets you see where you've applied it on clear and translucent glass. 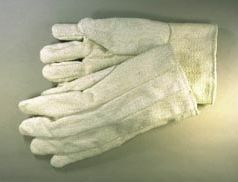 (burns out cleanly when fired) 4 oz. Applicator Bottle. Glue for glass kilnforming. Holds its applied shape and make calligraphic powder lines easier. The gel is thicker and has a much more tackier feel than Glastac Glue. Holds pieces in place prior to firing. Slow drying allows readjustments as you work. Organic colorant lets you see where you've applied it on clear and translucent glass. (burns out cleanly when fired) 4 oz. Applicator Bottle. This duel purpose product is one of the most popular fusing items ever. 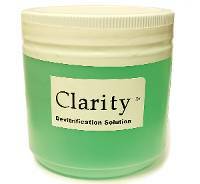 It is both an amazing gel glue (like hair spray on steroids) and a powerful overglaze that prevents devitrification! 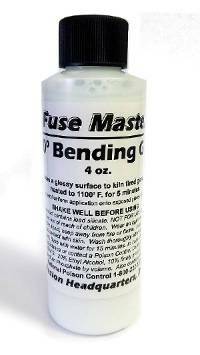 Fuse Master Fusing Solution is a clean burning gel that bonds frit, powders, enamels and paints before you get it to the kiln and prevents devitrification during firing. It is ideal for all art glass, window glass, slumping bottles and just about any kiln application. 8 oz. bottle. 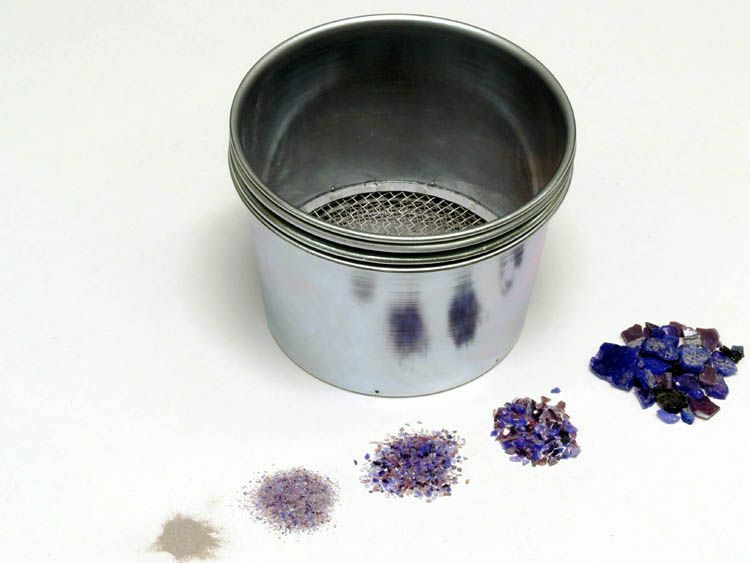 The Powder Vibe is a convenient way to apply frit to your fusing project. Fill with frit and use the easy touch speed control in the handle to allow for amazing precision and consistency in dispensing frit or enamels. Sleek body styling allows for use in both the right and left hand. Runs on two "AAA" batteries which provides 14 to 18 hours of use. Comes with complete instruction and care guide to keep the Powder Vibe properly operating efficiently.